Is Your Child Old Enough to Play Football? SportsEddy youth football camps are no contact camps, where kids can learn the game and brush up on their skills in a highly supervised and safe arena, while having a fantastic time. 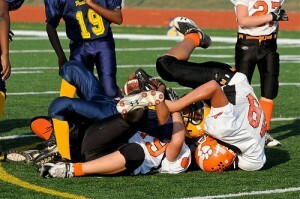 But the sport of football is a contact sport, which makes many parents nervous. It’s a fact: parents who love to watch football are likely to have kids who love it too, and want to play it. But the sport that adults love to watch is rife with injuries, so many parents who would be delighted to see their kids play baseball or tennis are reluctant to allow them to play football. Take heart, parents! There are many things you can do to assure that your kids have a great, safe experience with the game. The Institute of Sports Medicine and Athletic Trauma actually did a study, showing that the injury rate for youth football (younger than the high school level) is substantially lower, ranging from only 1/3 to 1/9 of the rate at higher levels. Children mature at very different speeds. According to the National Alliance for Youth Sports, by five to seven years of age kids already have the necessary motor skills to learn the skills necessary for football. But does that mean they have the emotional skills? Know your own child. Football is both aggressive and competitive, with physical contact that can hurt or scare children if they aren’t ready for it! What one six year old can handle and find fun might take another child until junior high to be ready for. Fun is the key, if your child isn’t having it—he or she is either too young for the sport, or it’s just not the right sport. Have your child learn flag football first. This is a fantastic way to prepare kids for tackle ball. Before signing children up for any organized team sport, make sure they understand the level of commitment involved: how many practices a week, how many games, how long is the season; let your kids know what they are really getting into. (Many football leagues require practice at least four times a week, not including the actual game.) By the age of nine or ten, many kids are old enough to understand and make this type of commitment. Talk to the coaches, and find out their philosophy. Is it to make the experience as fun for the kids as possible, to teach them teamwork and perseverance, or is it to rack up wins and “toughen them up?” Most experts agree that for young children, competition should not be emphasized, but rather learning the fundamentals and necessary skills of the game in a way that is the most fun possible. According to former NFL head coach Tony Dungy. "Coaches who make the experience enjoyable have the best results with their players. Coaches are there to teach players the fundamentals of the game. Fun is a big part of fundamentals."